Imagine using tens of thousands of GPUs to train your neural network. 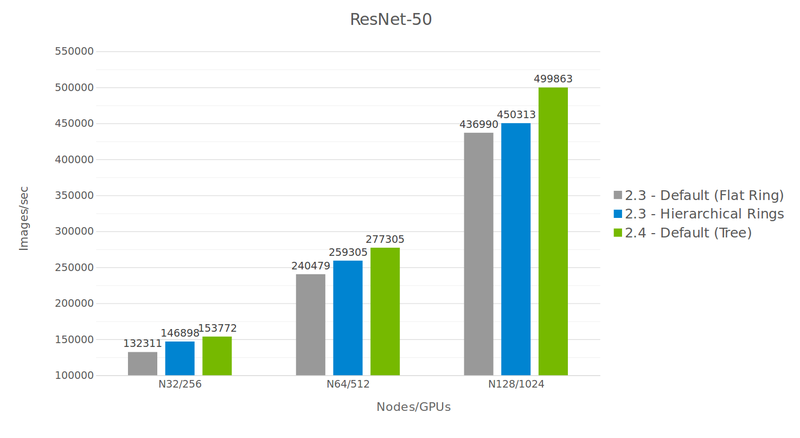 Using multiple GPUs to train neural networks has become quite common with all deep learning frameworks, providing optimized, multi-GPU, and multi-machine training. Allreduce operations, used to sum gradients over multiple GPUs, have usually been implemented using rings   to achieve full bandwidth. The downside of rings is that latency scales linearly with the number of GPUs, preventing scaling above hundreds of GPUs. Enter NCCL 2.4. Many large scale experiments have replaced the flat ring by a hierarchical, 2D ring algorithm    to get reasonably good bandwidth while lowering latency. 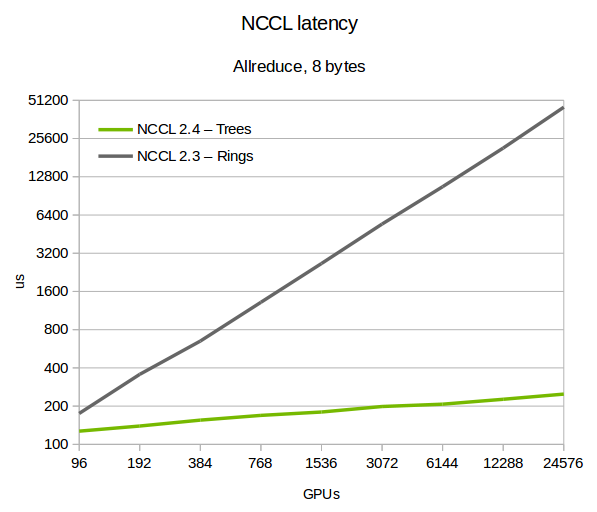 NCCL 2.4 now adds double binary trees, which offer full bandwidth and a logarithmic latency even lower than 2D ring latency. Double binary trees were introduced in MPI in 2009  and offer the advantage of combining both full bandwidth for broadcast and reduce operations (which can be combined into an allreduce performing a reduce, then a broadcast) and a logarithmic latency, enabling good performance on small and medium size operations. 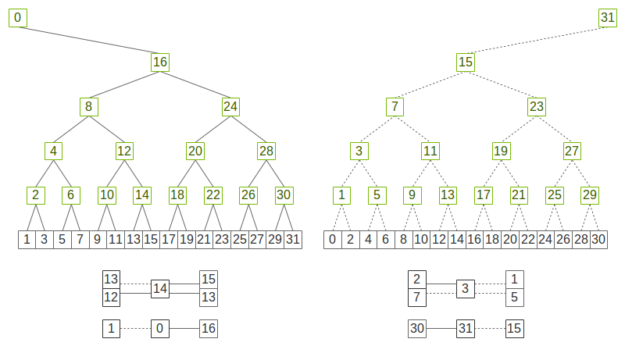 In NCCL, we build binary trees using an easy-to-implement pattern which maximizes locality, as shown in figure 1. Double binary trees rely on the fact that half or less ranks in a binary tree are nodes and half (or more) ranks are leaves. Therefore, we can build a second tree using leaves as nodes and vice-versa for each binary tree. There might be one rank which is a leaf on both trees but no rank is a node on both trees. Figure 2 shows how we can use the pattern above to build a double binary tree by flipping the tree to invert nodes and leaves. Figure 2. Two complementary binary trees where each rank is at most a node in one tree and a leaf in the other. If you superimpose the two trees, all ranks have both two parents and two children except for the root ranks, which only have one parent and one child. If we use each of the two trees to process half of the data, each rank will at most receive half of the data twice and send half of the data twice, which is as optimal as rings in terms of data sent/received. We tested NCCL 2.4 on various large machines, including the Summit  supercomputer, up to 24,576 GPUs. As figure 3 shows, latency improves significantly using trees. The difference from ring increases with the scale, with up to 180x improvement at 24k GPUs. We confirmed that the system maintains full bandwidth with double binary trees. At scale, bandwidth degrades a bit when we cross L3 switches in the InfiniBand fabric, which we believe is due to inefficiencies between the NCCL communication pattern and InfiniBand routing algorithms. While not perfect, this might be improved in the future. Even so, trees still show a clear advantage even when limited in bandwidth because of their small initial latency. However, NCCL automatically switches back to rings when that pattern results in greater bandwidth. Figure 5 shows performance improvement on DL training is significant, and increases as we scale to larger numbers of GPUs. 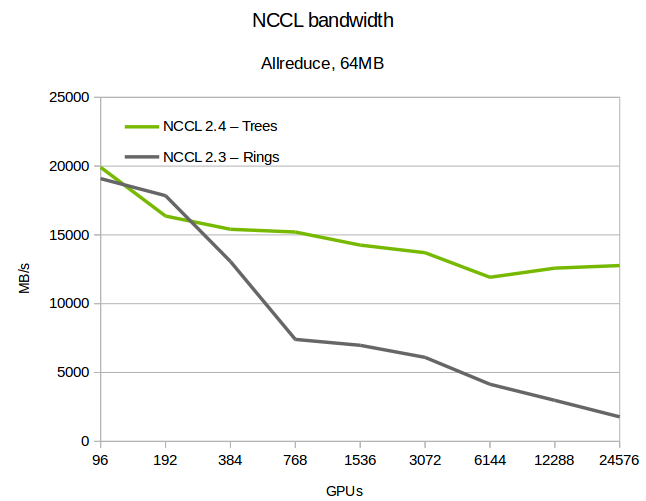 We compared NCCL 2.3 and NCCL 2.4, as well as the 2D hierarchical rings using NCCL 2.3. The hierarchical ring is a 2D ring (intra-node/inter-node being the 2 dimensions) which performs a reduce-scatter operation inside the node, then multiple all-reduce operations between nodes, then an all-gather operation inside the node again. While the hierarchical rings perform better than non-hierarchical rings, their advantage at scale remains constant. 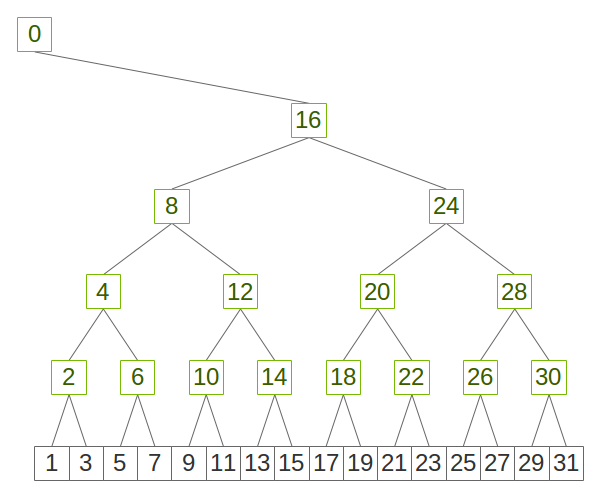 The tree algorithm, on the other hand, offers an increasing advantage as we scale. NCCL operations behave as CUDA kernels. Once the operation launches on a CUDA stream, the user waits for its completion using stream semantics, e.g. cudaStreamQuery or cudaStreamSynchronize. It’s convenient to have the NCCL operation start as soon as the CUDA kernel producing the data completes, but it doesn’t let NCCL report errors during communication. However, as we start using the network between nodes, network errors can occur and could prevent the NCCL operation from completing, causing a hang. This becomes increasingly important as we grow in size. NCCL 2.4 introduces two new verbs : ncclCommGetAsyncError and ncclCommAbort to handle this. Programs can call ncclCommGetAsyncError in a loop waiting for operations to complete. If an error happens, they can abort the application or try to only abort the communicator operation with ncclCommAbort, then recreate a new communicator with the remaining nodes. This function can be generalized to including polling for other asynchronous operations, such as MPI, socket, or other I/O operations. NCCL 2.4 comes with native support for TCP/IP Sockets and InfiniBand Verbs. TCP/IP sockets should work on most networks but can also be bandwidth- and latency-limited due to limitations in the kernel driver. CPU affinity can also be complex to handle. The InfiniBand verbs library enables an application to bypass the kernel and directly handle all network communication from user space. This is the prefered API to use on InfiniBand and RDMA over Converged Ethernet (RoCE) capable hardware.. Some other networking providers have different network APIs which provides better performance than TCP/IP sockets. Those vendors can get the best performance from NCCL by implementing an external network plugin to be used by NCCL when present. This can be provided in the form of a library named libnccl-net.so. NCCL includes an example in ext-net/dummy. Check out one example in the plugin for the libfabrics API. You can get started scaling your applications to massive numbers of GPUs today. Pre-built NCCL package can be obtained from the download page. The source code is also available on github. Sylvain Jeaugey is a senior software engineer at NVIDIA developing the NCCL library since its creation in 2015. He has 15 years of experience in large scale distributed computing. He has been working on various MPI implementations, developing and integrating high-speed networks technologies, and designing large network fabrics.